Afghanistan's ambassador to the US, Said Jawad, has said a US-backed plan to form local tribal groups to help combat the insurgency is very risky. The US hopes groups similar to those that have had success in Iraq will counter the growing insurgency and the lack of security forces. But Mr Jawad told the BBC the plan could backfire. He said it could undermine state institutions and actually strengthen warlords and criminals. Mr Jawad is the latest Afghan official to publicly raise concerns about the US-backed plan. "In order to gain a short-term term victory we might be in danger of losing the long-term objective of building state institutions," he said. Mr Jawad said that Afghanistan's traditional tribal structures had been undermined by three decades of conflict. He said if the plan was not properly managed it could strengthen the warlords and criminals. 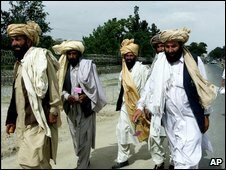 The plan has revived memories of the militias formed in the 1980s by Afghanistan's Communist government. They later became involved in factional warfare. But the US ambassador to Kabul, William Wood, said the plan, which is due to be tried out in Wardak province near Kabul, was not a re-creation of those tribal militias. He said the groups would not be armed by the Americans, but receive training, clothing and military back-up. The governor of Wardak says the plan is still being discussed and the groups will be involved in things such a reconstruction as well as security. But critics say the groups will have to have weapons to be effective and are wondering where those arms will come from.